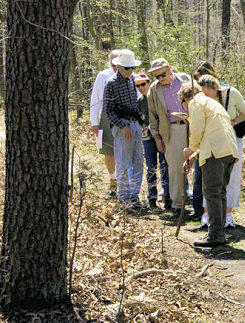 Description: Explore the Arboretum’s diverse plant communities on a guided walk led by an Arboretum docent naturalist. Explore the bottomland forest and upland paths, meander through majestic beech trees, traverse the native meadows, and follow the narrow Tuckahoe Creekside path. Guided walks are free for members and free with admission for the general public. Tours begin at the Visitor’s Center and last approximately one hour. To schedule a guided walk for more than 10 participants, contact Robyn Affron, Visitor Services & Volunteer Coordinator, at raffron@adkinsarboretum.org or 410-634-2847, ext. 25.